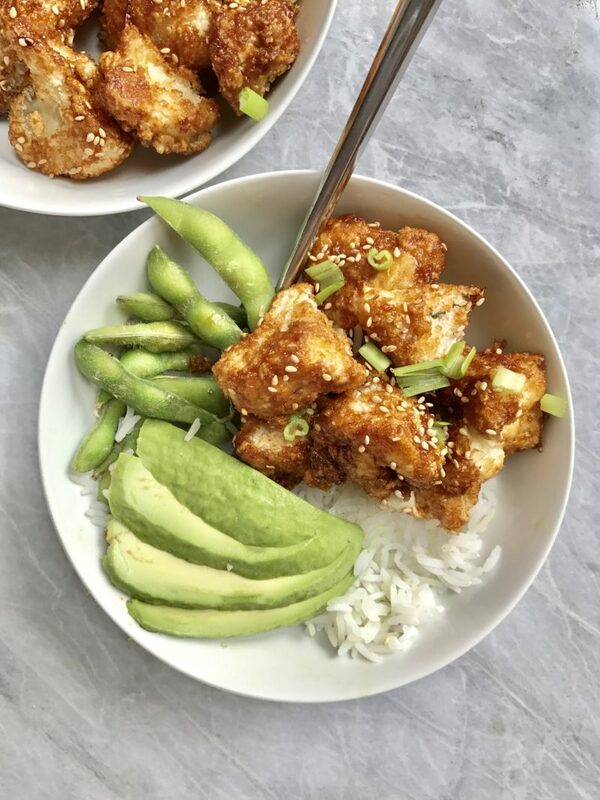 Inspired by my Bang Bang Tofu recipe, I decided to switch it up but use Cauliflower instead of tofu as the base, and make a sesame sauce. 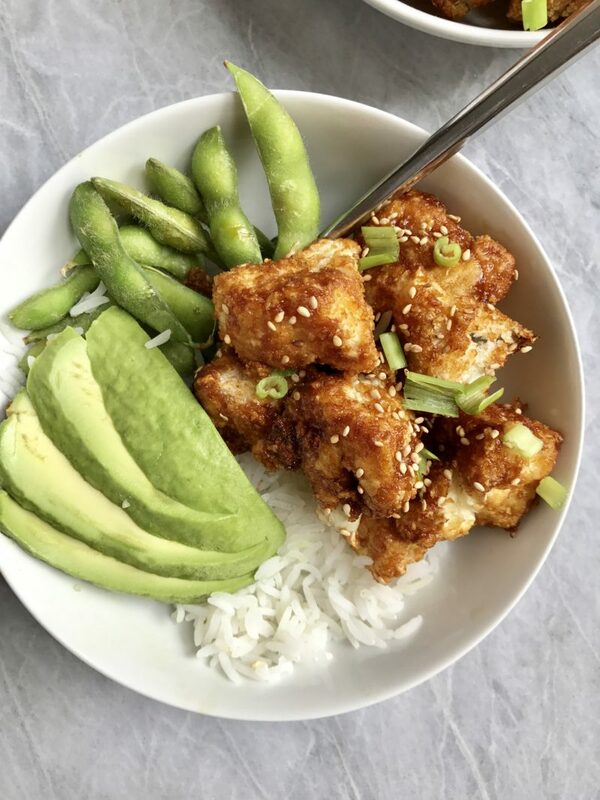 Who knew that baking your tofu in panko could actually be crispy and delicious? You definitely do not need to deep fry something to make it taste good. I had such a good time whipping up this dish, inspired by my own past recipes. Not everyone likes tofu, and I wanted to be able to come up with a dish anyone could enjoy. This is particularly delicious over some rice with avocado and edamame! However, broccoli works just as good too! I hope that you guys enjoy this recipe! If you ever make any of my recipes, don’t forget to tag me at @plantbasedjane or hashtag #plantbasedjane so I can see! Pre-heat your oven to 475 degrees Fahrenheit. Set up your breading station. Combine your flour and water in a bowl. Add water gradually to form a slightly thinner version of a pancake batter. You don't want it too thick. Place in oven for 25 minutes. After 25 minutes, flip and cook an additional 20 minutes. Ovens vary, so keep a watchful eye. When the florets are almost done cooking, begin to make your sauce. Add all your sauce ingredients into a bowl and mix to combine & make sure the corn starch isn't too clumpy. Heat a sauce pan on low-medium heat and add your sauce. Cook until thickened (this should only take 1-2 minutes). When florets are done, add them to a bowl and pour the sauce over. Mix and make sure all the florets are evenly coated. Top with some sesame seeds and green onions. Serve immediately! Thank you so much Rita 🙂 I hope you enjoy!!!! 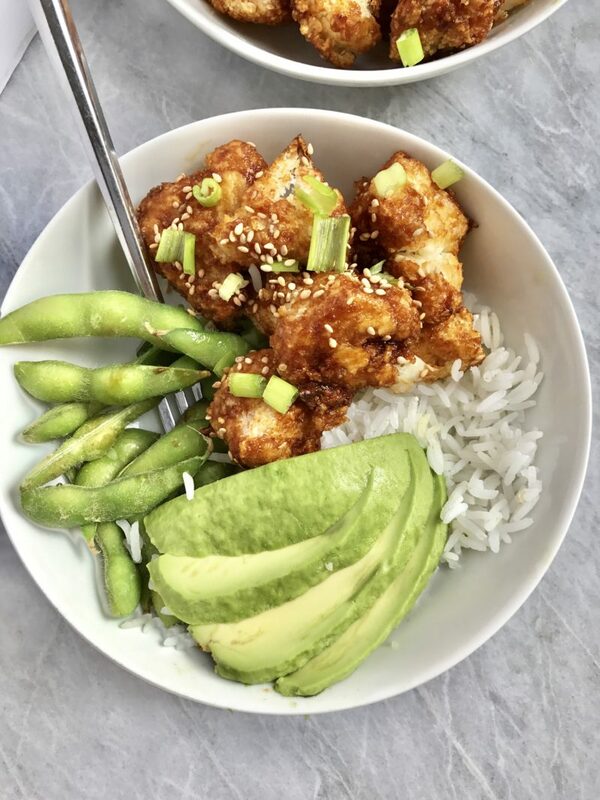 This cauliflower is SO good! I’m waiting for my rice to finish cooking but I just cannot stop picking at the cauliflower. I did end up doubling the sauce recipe though. Oooo this sounds tasty! Not a huge fan of cauliflower so hopefully this will convert me! Love literally all your recipes- keep at it girl! Jane- this looks so good, can’t wait to try this out tomorrow night! My husband also writes a vegan blog called Vegan Futura, check it out!